"Milwaukee Charter Fishing | Racine Fishing Charters | Fishing"
Welcome aboard the LEADER, a custom 36-foot Tiara! The Leader is a true Tournament and Charter Fishing Machine. 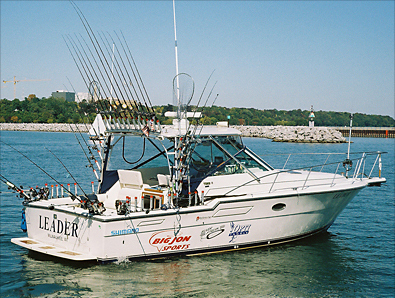 Our boat is a Tiara yacht named LEADER; which is a proclaimed fishing machine that is 36 feet long and 13 feet wide. Tiara Yachts have one of the largest back decks for fishing in the Charter industry. The boat is built to ride very comfortably in Lake Michigan waves when other boats are unable to handle the waves in comfort. 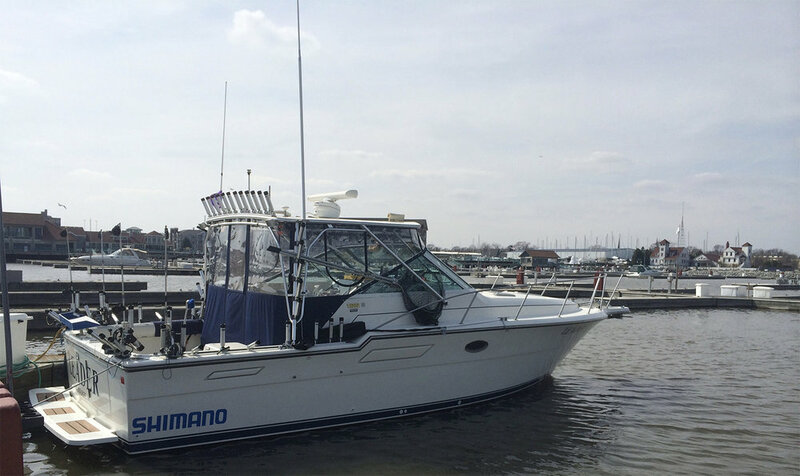 Our boat has become part of Milwaukee and Racine Wisconsin’s most popular fishing charter services. The Leader follows major schools of fish, putting you in the hottest areas possible throughout the season, resulting in more limit catches and happier customers. The LEADER has true power and speed to get you to the fishing area before the others get there. She is outfitted with twin high-performance 8.1L /496ci Crusader engines that provide 950 horsepower to get us to the hotspots quickly. There is a private head (bathroom) for your convenience. We also have heat and air conditioning for your comfort in the cabin. Your safety is of utmost importance to us, so you can be assured that we have all of the U.S. Coast Guard- approved safety equipment. There are also 2 VHF marine radios, as well as iPhones available to contact help if ever needed. The Leader is equipped with state of the art electronics, which include Raymarine Radar, Chart-plotter, GPS, Fish finder and Autopilot. We also have electronic temperature and speed indicators for the surface and downrigger depth made by Fish Hawk electronics. The boat is also fitted with 4 Big Jon Brute ES downriggers, which are the fastest downriggers on the market, and we have over 60 rod holders for the perfect placement of a large spread of rods.